Twenty-five years ago, John F. Savage passed away at age 62. This has been an emotional time for me as I reflect on his life and how much I have missed him the last quarter of a century. Many in the financial services industry knew John as a mesmerizing speaker whose memorable quips and concise financial lessons inspired thousands. Locally, John was known for founding and building — along with his brother, Bob — a successful, independent and diversified financial services firm, Savage & Associates. 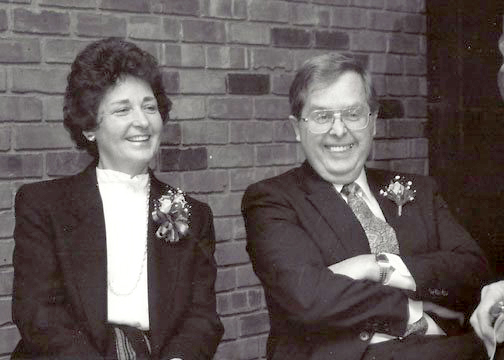 John and Mary Kay Savage smiled at the 1988 press conference when it was announced Centennial Hall would be renamed John F. Savage Hall. A 1952 UT alumnus, Savage was co-chair of a campaign that raised $10 million for the facility, which later adopted the name John F. Savage Arena. The longtime University benefactor was a past president of the UT Alumni Association and a former member of the UT Foundation Board of Trustees. He received an honorary doctorate from the University in 1985. He is known equally or more in northwest Ohio from the countless known (and many unknown) philanthropic efforts, primarily fundraising in service of the poor, the Catholic Church and The University of Toledo. Me, along with my eight siblings, knew John Savage as dad, and I am sharing from that perspective. The story I will share about John Savage is not known by many and will truly put in perspective how his success was so improbable. It is truly an “only in America” story. My father grew up in what, at best, could be described as a working-class neighborhood in Toledo with his eight siblings in a small home. His mom died when he was 7 leaving his father to raise nine children while owning a small corner grocery store, Savage Market. Out of necessity, all nine worked in the grocery store. This scenario does not seem like the right recipe to produce a man who would later be inducted into the City of Toledo Hall of Fame for his philanthropic and business achievements, but it did. His family instilled a work ethic, values, and a burning desire to do better. He and all eight siblings remarkably graduated from college, and he began an entrepreneurial career in his 20s. 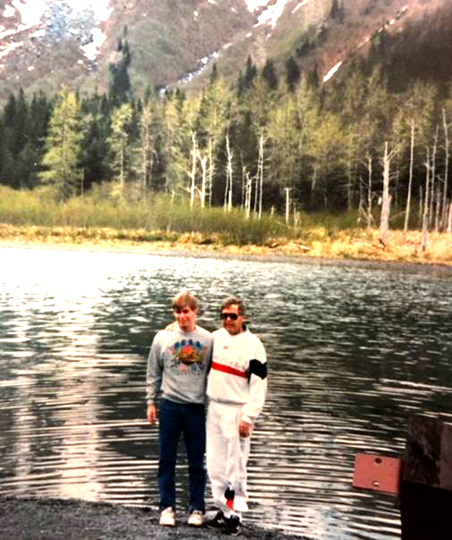 John Savage and his son, Sean, 18, posed for a photo during a trip to Alaska in 1989. By the time I came along as the eighth child of my parents, the business was growing, and his community work was well-known. How did John Savage go from growing up poor and without a mom to advising CEOs of Fortune 500 companies, raising millions of dollars for charity, and, with my mom, building a strong family? • Positive energy. My dad exuded confidence and positive energy to everyone he encountered. People loved being around my dad because they felt better about themselves and what they could accomplish. He was on his death bed and still positive and thankful. • Values. My dad did the right thing. He was principled and led by example. His commitment to high standards in business and in his personal life was a tremendous example to me and my siblings. What a blessing for a child to witness in their parents. • Guts. He started with nothing and so his view was that he was risking nothing by taking chances in life. He was fearless in asking for business and raising money for causes. • Loyal. Even after becoming a household name in Toledo and the industry, he never forgot his roots. He remained a loyal friend to the guys from the old neighborhood and was forever grateful to The University of Toledo for allowing him to be educated on a nothing budget. • Humble. After all the success and accolades, he remained grounded. He made sure all his children understood what it took to do well in life, and once you do well to not change. • Balance. My dad believed in a life-work balance, which involved a focus on family, spirituality, work, physical well-being, and doing acts of charity. He was far from perfect, but he did a good job in each of these areas. Twenty-five years ago, I was just out of college and about 120 days from getting married. My dad’s death shook me at my core, but I turned to the valuable life lessons I was so fortunate to have been taught by my parents. Today, my wife, Carolyn, and I feel so blessed with our six children, and I feel particularly blessed to walk into an office each day my dad walked into for so many years. Looking back, I am still amazed at how far my father came in his life, and the good fortune I had to be under the same roof with him for 22 years. God speed, dad! Sean Savage is a financial adviser at Savage & Associates in Toledo. This entry was posted on Friday, March 23rd, 2018 at 3:13 am and is filed under Advancement, Alumni, Athletics, Business and Innovation, Op-Ed .